Looking for an easier way to stay healthy? Then you definitely have to check out the new AeroLife product where you can insert a mini-refillable-device into your mouth and just draw a powder into your mouth to receive nutrients. There are various different formulas that they have created such as an energy booster for sports, an immune booster, and many others. We like this product because it is something that you can use throughout the day without having to take vitamins and it is actually quite a bit of fun as well. You can basically have different apps for your day in the health form such as certain vitamins for sports, some for business, and some for immunity. The system delivers these sensations directly into your mouth, of vitamins and other nutrients, making it fast, fun , and easy to enjoy doing the right thing. Again you just pull thecolored strip, place it between your lips and draw out powder. Swallow after that and it will deliver the nutrients to your body. Want to see it in action? 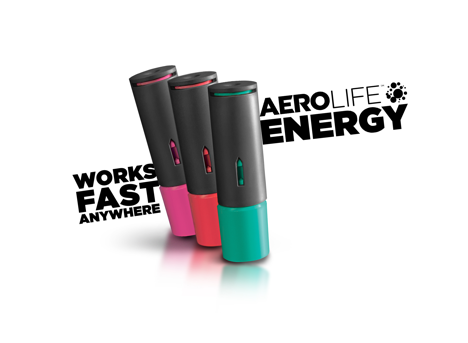 Then check out the AeroLife video below where you can get a better idea of exactly how this works and what it does. 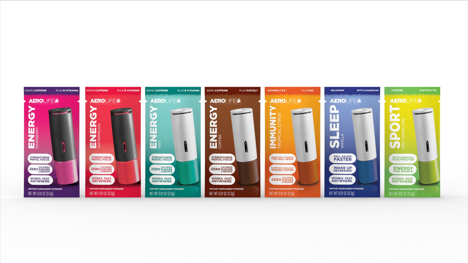 It is something where you can keep a couple of these by your desk at work or at home by the TV and however you are feeling you can pick up an AeroLife to enjoy. As you can see in the graphic above it is super simple to use AeroLife and integrate it into your daily work, life and fun. You literally just pull it open, gently draw the powed into your mouth and then push it closed when you are done. We recommend leaving it on your desk and perhaps a second one of them at home somewhere so no matter where you are you always have easy access to your new essentials! Perhaps even you can leave another AeroLife in your car so if you are tired on the way to work or before going out to a big party you can enjoy it! Ready for important outings? Strengthen your mental focus in a controllable manner so that you are effective. This truly is smart nutrtition and this air based product is quite interesting. Just being able to pull a colored tab, insert into your mouth, and get the powerded vitamins right away is really cool. So how do you use it? the video below explains what to do. So what makes them fun other than the fact that you do not have to swallow a gross pill? Well in our minds we really enjoy things because there are multiple flavors which help to make vitamins fun and tasty so it isn’t this boring process that you go through everyday. Whether you have ADD or not, sometimes you always want to have your hands by your mouth so people will chew on a pencil or over eat… we think that AeroLife can help solve this problem or make it better by giving you something better to do. If you really need to have your hands near your mouth or are tempted to eat something, why don’t you try to substitiute it with AeroLife so at least your are getting something healthy! Let us know your thoughts in the comments below about AeroLife and this new revolutationary product and how you envision yourself using it. We have included an image of their product line below so you can become familiar! By the way if you were interested in knowing some of their flavors then we recommend that you check out some of our favorite flavors such as Mint, Raspberry, Watermelon, Tropical Citrus, Mint Lemonade, Vanilla, Energy, Immunity and Sleep among others. They taste great and you can see some pictures and videos of us enjoying these in our post here! Visit the Aerolife website today so that you can know everything about this new system! When I tried it I really had fun learning about all of the positive things it was providing my body! We are grateful to AeroLife for bringing us the opportunity to share our love about the product with you as bloggers so that we could try it and share our new favorite vitamin!